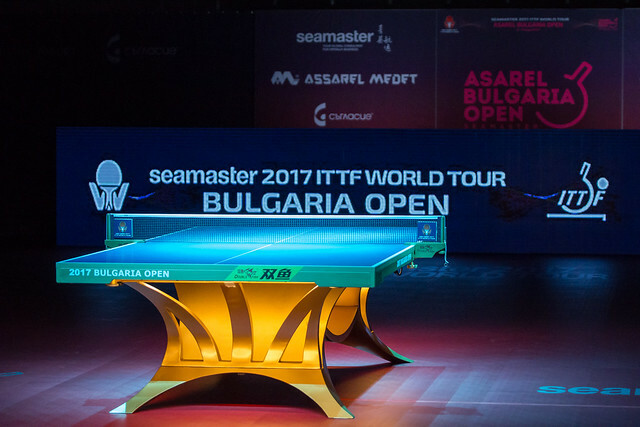 Stopping the Japanese juggernaut; that is the task facing the rest of the world on Friday 18th August in the second round of the Men’s Singles event at the Seamaster 2017 ITTF World Tour Asarel Bulgaria Open in Panagyurishte. Germany’s Dimitrij Ovtcharov, the top seed, is the one player not charged with arresting the Japanese advance; he meets Swedish qualifier, Elias Ranefur, in a match which is very much like for like. Elias Ranefur has very much adopted the German’s backhand style of serving; in fact it is even more exaggerated. However, for Nigeria’s Quadri Aruna, Belgium’s Cédric Nuytinck and Chinese Taipei’s Peng Wang-Wei, adversaries from the Land of the Rising Sun await. Neither Cédric Nuytinck nor Peng Wang-Wei starts as favourites. Cédric Nuytinck, the no.12 seed, faces Jin Ueda, the no.5 seed; Peng Wang-Wei, who caused a first round surprise by overcoming India’s Harmeet Desai, the no.11 seed (11-3, 9-11, 11-4, 11-7, 11-8) confronts Kenta Matsudaira, the no.2 seed. It is arguably the opposite for Quadri Aruna; he is the no.3 seed but I venture to suggest that his opponent, 17 year qualifier Yuto Kizukuri starts the favourite. Earlier this year at the ITTF Challenge Zagreb Open, in the second round of the Men’s Singles event, Yuto Kizukuri beat Quadri Aruna in four straight games (11-5, 12-10, 15-13, 11-9). Could it be that after the second round of the Men’s Singles event has concluded, there will be only one non-Japanese player left standing? Meanwhile, in the counterpart Women’s Singles event, with the second round line-up in entirety from Japan, it is an absolute certainty than it will be only Japanese players left standing! Kasumi Ishikawa, the top seed, meets Mizuki Morizono; Mima Ito, the no.2 seed, opposes Saki Shibata, the no.13 seed, whilst Hitomi Sato, the no.3 seed, faces Yui Hamamoto. The seeds start as favourites but the intriguing encounter is that between Honoka Hashimoto, the no.4 seed and Marina Matsuzawa, the no.15 seed. One year ago they met in the very same round, Honoka Hashimoto emerged successful by the very narrowest of seven game margins (11-4, 11-7, 6-11, 3-11, 11-7, 10-12, 11-9). Another hard fought encounter awaits. Japan to the fore, it is the same in both the Men’s Doubles and Women’s Doubles events where in each they field the top seeds. At the quarter-final stage, in the former, Jin Ueda and Maharu Yoshimura meet Yuto Kizukuri and Kenta Matsudaira; in the latter Honoka Hashimoto and Hitomi Sato oppose the Czech Republic’s Dana Cechova and Iveta Vacenovska. Eyes very much focused on Japan but also on the partnership of Chinese Taipei’s Lin Yun-Jun and Yang Heng-Wei, the surprise first round winners against Russia’s Alexey Liventsov and Mikail Paikov (6-11, 8-11, 11-6, 11-8, 15-13). They meet India’s Soumyajit Ghosh and Sathiyan Gnanasekaran, the no.5 seeds. Likewise at the quarter-final stage of the Women’s Doubles event, the combination of Slovakia’s Barbora Balazova and the Czech Republic’s Hana Matelova is a pairing to note. In the opening round, they caused an upset by beating the partnership formed by Hungary’s Szandra Pergel and Poland’s King Stefanska (11-9, 8-11, 11-9, 3-11, 11-7). In the round of the last eight, they face the partnership formed Sweden’s Matilda Ekholm and Hungary’s Georgina Pota, the no.2 seeds. Play in the Men’s Singles and Women’s Singles event proceeds to the quarter-final round, in the Men’s Doubles and Women’s Doubles to the semi-finals.